(Spanish American War Patriotic) Remember the Maine, red and blue patriotic design showing American Flag and the U.S.S. 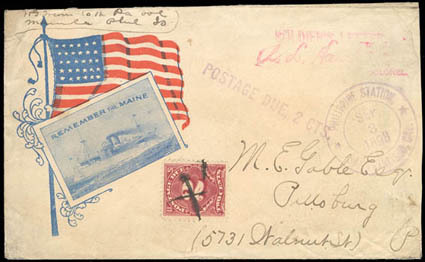 Maine on cover with pink "Solider's Letter" handstamp to Pittsburgh Pa., sender's return of Pennsylvania Vol., purple "Philippine Station, San Francisco, Cal. Sep 3 1898" double-circle datestamp and matching "Postage Due, 2 Cts." straightline, Pittsburgh (10.13) received backstamp and 2¢ postage due tied by manuscript "x" upon arrival; reduced slightly at right, Fine. (Spanish American War Patriotic) 3rd Reg. Co. A U.S. Vol. Eng's., illustrated black and orange patriotic design showing Castle with orange windows, on cover endorsed "Soldiers Letter, W.F. Schilling" to St. Louis Mo. with "Mil. 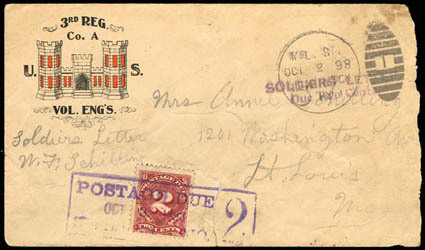 St. Oct 2 98, Lexington, Ky." duplex and purple "Soldiers Letter / Due Two Cents" two-line handstamp, 2¢ postage due affixed and tied by purple large "Postage Due, Oct 3, 1898, St. Louis No. 2" framed handstamp; faulty, Fine and rare design, ex-Malpass, Hahn.